A client just got diagnosed with breast cancer. She is purchasing a new bed for the room she will be moving in. Before she does, she wanted to make sure the room was energetically okay and that the bed wouldn’t be on a noxious zone. This is the bedroom she is going to stay in during her recovery. Luckily, the room turned out to be A-okay. The electromagnetic field (EMF) readings indicate there are no major frequencies in the room. And, the earth line crossings are in optimal places away from her head or body. The most noxious area of the room is in a corner that we had already discussed putting a plant in. During the assessment we felt an area where she could rest peacefully. And how she could let go in this room without having to worry about anything but recovering. Clients of mine just bought a 4-bedroom, single-family home and hired me to assess it for geopathic stress zones. They are planning to gut the inside but wanted to know what I felt before signing off on the architect’s plans. One of their main concerns was the bedroom. They want to find a good place for the bed where it isn’t on any geopathic stress zones. This is important for good sleep. It is also really important for health, particularly because the husband has heart problems. The less stress his heart is put under, the better for his overall wellbeing. 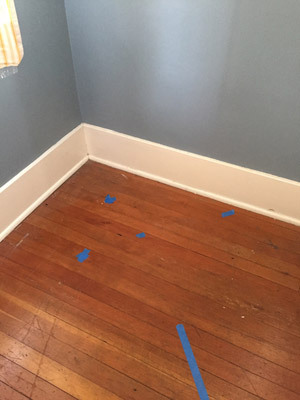 Below is a photo of the earth lines in their bedroom. Where the horizontal and vertical lines overlap is an earth line crossing. There are three shown in this photo. It is important not to sleep on a crossing. And, in this man’s case it is important not to have an earth line running across his heart. An interesting find was an energetic wall in the room, labeled #1 in the photo. It is not an earth line but felt like one at first. 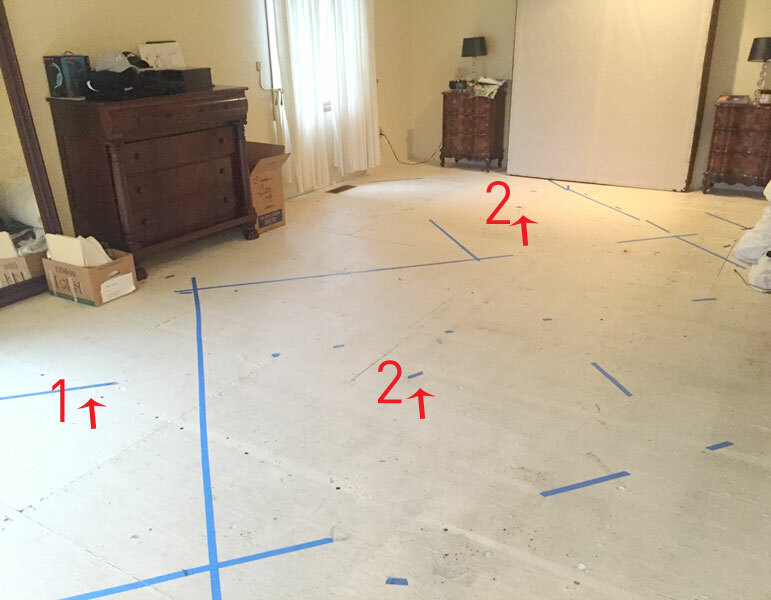 Also, there were mucky spots in the room, which I labeled as #2. These spots ran in a line and felt like water could be flowing beneath the house. The wife had been sleeping on this line and I recommended that she move the bed over a bit. One comment about the overall house is that it felt separated into three parts: 1. pool table room & front room 2. kitchen & living room 3. bedrooms. There wasn’t a meeting point so it felt like if the husband spent more time in the pool table room and the wife spent more time in the bedroom, for example, they’d be living separate lives and not able to feel one another. This could potentially lead to marital problems. I spoke with the architect and she is planning to redesign the house so it doesn’t feel disjointed. She is also taking into consideration other findings from my home survey. In addition, there was an electronic mess behind her bed. The readings of electromagnetic fields on the upper part of the bed (near the head and upper body) were high. Influence factors include the cord clock radio, cordless phone charger with 110V/12V transformers and the unshielded wiring of the electric installation. The electromagnetic fields were reinforced by the metal bed and the coil-spring mattress. The headboard measured values beyond the international recommended threshold of 2 milliGauss. In addition, on the left side of the bed, the readings in the head area are over 20 V/m. Replace the 110V clock radio with a battery driven alternative. Move the cordless phone at least 4 feet from the body at night. Regarding the exposure to high frequencies from the phone at night, it would be advisable to ban it from the bedroom altogether. The wiring of the electric installation appears to be unshielded, which means it does not have an earthed metal coating. Ideally there would be an integration of a demand switch which shuts down all electricity at night. Replace the metal bed frame and the spring mattress with non-metal alternatives. The metal bed holds and reinforces the EMF from installations. As long as the demand switch is not in place and the electric cables are not properly shielded, the radiation effects are strong. 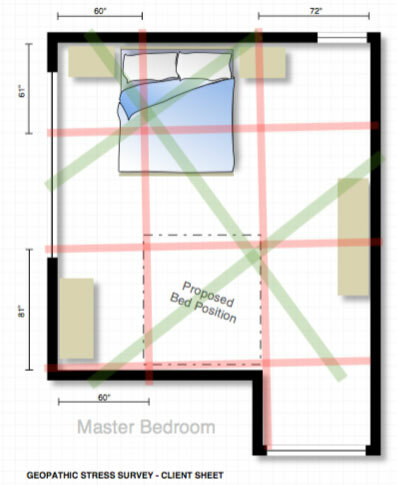 Consider relocating the bed to the opposite side of the room as indicated in the drawing. If she didn’t want to do that we suggested moving it 2 feet to the right so as to avoid the crossings. A couple in Huntington Beach, California, was talking to my business partner and I about the husband’s numb feet. 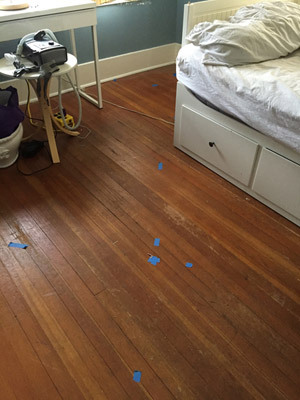 When we evaluated their bedroom we found an earth line crossing on the side of the bed where the husband sleeps and it was at his feet. We suggested that they move their bed over a couple inches to the left so the crossing wouldn’t be near the husband’s feet.